Air Rights, also known as Transfer Development Rights (TDRs), refers to the amount of empty space above a property that can still be built or transferred based on a lot's zoning. The air rights of these “underbuilt” lots can be very valuable to a developer, enabling the developer to build a bigger building than the development site is zoned for – either a taller and/or wider building. City Center, which was founded in 1964 by Robert I. Shapiro, is one of the pioneers in the use of air rights. Bob is recognized as the preeminent advisor in assemblages along with the sale and acquisition of TDRs. Over the last several decades, he has been involved in over 3.0 million sq. ft. of TDRs. Lois Weiss (New York Post) has quoted that Bob is the Sky King of air rights. The ability to acquire air rights is a combination of a three-dimensional chess game, with a little bit of Three Card Monte, put into a Rubik’s Cube. There is a need to have a full understanding of the Zoning Resolution, which can limit the height of a proposed development and limit the receiver site's absorption of TDRs. Also, having a depth of knowledge, as to what the market conditions are and how the Off-Site Inclusionary Housing bonus affects the valuation of zoning lot merger TDRs, is extremely important. Other types of third-party professionals can only offer limited insight. Due to the volume of transactions that City Center is involved in, we have a full understanding of market pricing given different considerations and can use this information to add value to a client's transaction. In addition to working directly with owners and developers, City Center is often brought in by both lawyers and appraisers to provide insights and advice on structuring TDRs for their clients. City Center’s vast knowledge of pending transactions and involvement in the day-to-day sale and acquisition of TDRs is critical to the appropriate valuing and successful closing of a transaction. (iv) off-site inclusionary housing (OSIH). A downloadable Reference Guide provides key terms, abbreviations, and acronyms related to air rights. While TDRs from a zoning lot merger were allowed prior to 1961, the zoning lot merger transaction was codified in the Zoning Resolution in 1961. It was the 1977 Zoning Resolution amendment that finally disassociated development rights and land ownership. “Single ownership” was no longer required to merge lots. (v) the potential East Midtown Subdistrict. 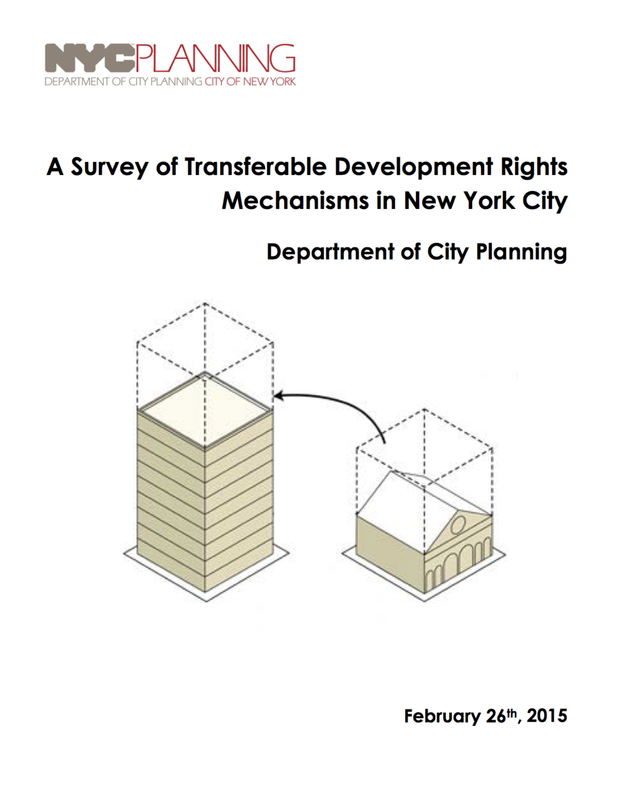 Special permit TDRs are transferred under a discretionary permit issued by the NYC City Planning Commission. For example, the landmark site transfer is a discretionary permit provided by the NYC Zoning Resolution provision 74-79, titled Transfer of Development Rights from Landmark Sites. The landmark site transfer allows for the transfer of TDRs across a street, where the amount of TDRs is subject to certain restrictions. However, this procedure is rarely used since the cumbersome process for a Uniform Land Use Review Procedure (ULURP) is time consuming and costly. Only 4 special permits have been issued in the last 25 years. Off-site inclusionary housing (OSIH) certificates are generated under the NYC Zoning Resolution provision 23-90, titled Inclusionary Housing. OSIH can be transferred as-of-right to a receiver property once the generating site's OSIH certificates have been approved by NYC's Housing Preservation and Development (HPD). OSIH can be sold to a qualified receiver property anywhere within the same Community Board as the generating property. Alternatively, OSIH can be sold across Community Board boundaries if the generating and the receiving properties are within a 0.5 mile radius of each other. A qualified receiver property needs to either have a R10 equivalent zoning or be within a specific Inclusionary Housing designated area. Existing OSIH certificates have already been approved by HDP and can be used today. Existing OSIH sell at a premium to to-be-built OSIH certificates. To-be-built OSIH certificates are certificates that will be generated in the future, so the vendor and the vendee enter into a forward contract for the delivery of these future certificates. Given the planning and construction time delay for a development site, which would be a receiver for OSIH certificates, buying to-be-built OSIH versus existing OSIH can be better for the purchaser. This is because the purchaser does not need to outlay 100% of the OSIH purchase price today for a project that will not be receiving a certificate of occupancy (CofO) and utilizing the OSIH for another 24-30 months. However, the downside to to-be-built OSIH certificates, from the purchaser's perspective, is the purchaser must be comfortable in the generating site delivering the agreed to OSIH square footage amount and in the timeline expected. As such, to-be-built OSIH certificates carry an additional level of project risk. If the generating site has issues in getting DCP sign off, then the purchaser will have issues receiving a CofO for their larger square footage building, which is predicated on receiving the OSIH. City Center works with both OSIH purchasers and sellers, so purchasers can understand the level of risk for a given OSIH generating site. As such, a purchaser can gauge pricing differences in comparing different to-be-built projects against one another and against existing OSIH options - for situations where a purchaser has alternative OSIH options. One example, of the existing OSIH certificates versus the to-be-built OSIH certificates decision, was a foreign consulate decided to pay a premium to purchase the existing OSIH certificates. This insurance premium cost the foreign consulate an additional $3.0 million, but it removed the risk of the future generation of the OSIH certificates. Below are third-party resources that provide additional background on transferable development rights.